Is it possible to make a duck walk without looking like a duck and quack without sounding like a duck? In politics, yes, it is definitely possible. Especially when dealing with that dreaded word that all politicians despise, TAX. With property taxes, they must find a way to massage the thing, so that it looks like it hasn’t gone up since the year before. So, how do they play that game downtown at Austin City Hall? It’s really pretty simple. They just don’t talk out loud about the percentage of a tax increase at all. What they do talk about is the tax rate. During boom times like we are in right now, property values are galloping upward. So, using simple math, you know that the tax rate can stay the same, while your property tax bill will be higher if the tax appraisal on your home has gone up. As recently as Thursday afternoon April 17th, I was told by one City Council member during Citizens Communications that the City complies with State law on property tax disclosure. He is technically correct in that their public hearing notices published in local newspapers comply with State law. But during annual budget deliberations, the City actually starts the process with a revenue assumption that raises taxes to the legal maximum of 8%. The final adopted budget may come in below that amount by a couple of percentage points. But what you will hear in the news media and from the City Council dais is how little they have adjusted the property tax rate. Little or nothing is spoken verbally about the true percentage of the tax increase. What do they have in store for this year’s budget cycle? Well, here is one key sentence in a memo to the City Council from Deputy Chief Financial Officer, Ed Van Eenoo, dated February 28, 2014: “City management has communicated its intent to present a proposed fiscal year 2014-15 Budget that maintains the property tax rate at 50.27 cents per $100 of assessed value.” (See Conclusion, second sentence). In other words, staff plans to “hold the line” on the tax rate, while collecting all the money that comes in from raising taxes on homes and businesses that receive big tax appraisal increases. In order to not raise taxes when property values increase, they would have to lower the tax rate. Last fall when the City Budget was adopted, KUT reported this headline story, “2014 Austin City Budget Holds Line on Tax Rate.” The implication was that taxes were not going up. But in fact, because of large appraisal increases, we did have a tax increase. But the percentage increase above the zero “effective rate” was not readily disclosed beyond the required public hearing notices. Better disclosure in the budget document with my proposed “Taxpayer Impact Statement” may not happen until we elect a new City Council in November. Now for a final bit of history. I am the culprit who dragged out my old Sears typewriter in 1987 and went to my State Representative and State Senator and proposed the Truth in Taxation law that I was reminded of today by one of the City Council members. Below is the cover page for House Bill 328, which established the State law. 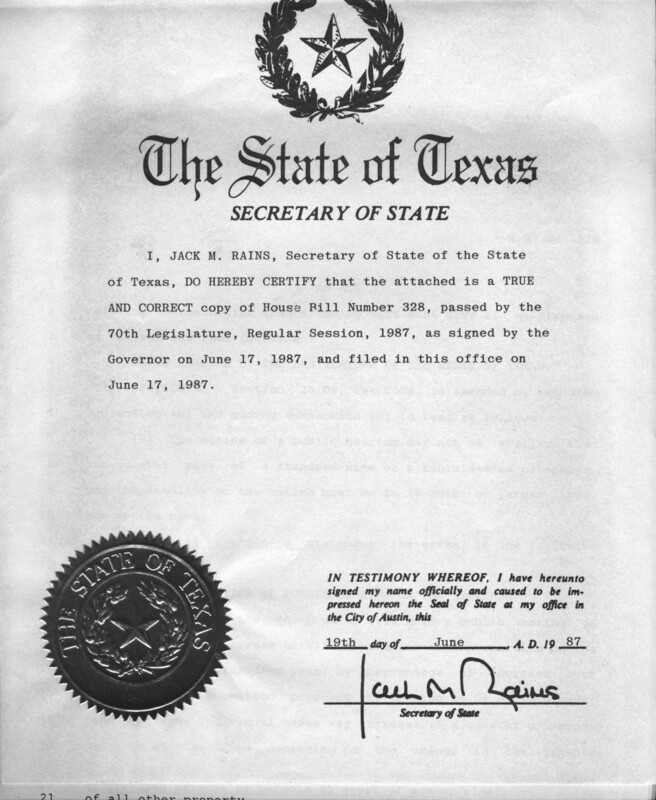 It was signed by Governor Bill Clements on June 17, 1987. Click the image below to enlarge it. This entry was posted in General Affordability Updates and tagged afford, affordability, Austin, Austin affordability, austin affordable, austin cost of living, cost of living on April 18, 2014 by Bill Oakey. Nice piece Mr. Oakey! I am looking for the answer to this question: Why is investment real property valued at a different (and lower) rate than real property that is owner-occupied (homesteaded)? I have been in a tussle with the TCAD staff over this, and have yet to get anything other than “you can’t compare apples and oranges” as an explanation. That explanation rankles me just like “because I said so…” I have studied the properties on my two blocks, and the value assigned to my structure is SIGNIFICANTLY higher (and thus, my taxes) than that assigned to rental property that is zoned exactly what mine is. I would be happy to share my documentation with you….aren’t property owners entitled to transparency in the appraisal process? No one knows the secret formulas applied, other than the appraisal board staff, who will not divulge them to the public. Do you know how this is done? Thanks.